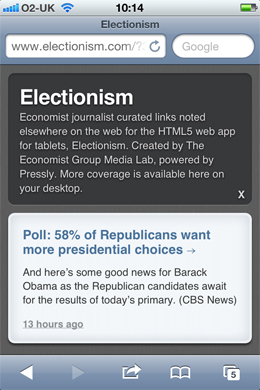 The Economist has launched Electionism, an HTML5 web app for tablets, focusing on the US election. Publishers will be interested to note the development of an app that works across a range of tablets, including the iPad, Galaxy Tab and Kindle Fire (yet to be released in the UK), and will also soon be available on the Blackberry PlayBook. Rather than being downloaded from an app store, it is accessed by following a link in the tablet’s web browser. Although designed for tablets, a simple version of the app works on mobile, presenting a Tumblr blog-style format (indeed, the app is “powered by Tumblr”). This is the the Economist’s first foray into a web app that will work across several devices, unlike its range of apps native to Android and Apple’s iOS. 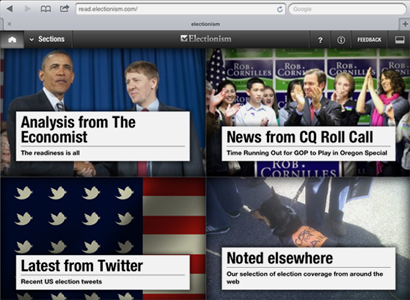 Electionism includes content from the Economist, CQ Roll Call and other noteworthy election reports from around the web. Electionism combines the Economist’s day-to-day opinion and commentary on the US elections, from our Webby-award-winning Democracy in America blog, with detailed on-the-ground coverage from CQ Roll Call and our picks of the best election coverage from elsewhere on the web, all wrapped up in a tablet-friendly format. It is extremely important to us that we provide our readers with not just commentary and analysis, but also the opportunity to discuss and debate the key issues. By building content sharing functionality through Facebook, Twitter and email into the Electionism app, we have provided readers with the ability to engage others in a conversation around the election. Electionism was created by the Economist Group Media Lab, an internal product innovation group, and built in conjunction with its Toronto-based technology partner, Pressly. Tom Standage, who is quoted in thus post, will be speaking at news:rewired, a conference for digital journalists organised by Journalism.co.uk. See the agenda, list of speakers and list of delegates. Tickets cost £130 +VAT and can be booked using the ticket page. More than 140 tickets have been sold. Book now to avoid disappointment. This entry was posted in Mobile and tagged Economist, html5, nick blunden, Tom Standage, us election, web apps on January 11, 2012 by Sarah Marshall. Twitter has launched an HTML5 app for the iPad that will be rolling out in the next week or so. 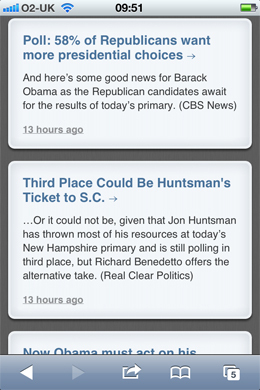 Mashable has a photograph of the app showing a two-column display. HTML5 apps, such as the one launched by the Financial Times in June, are web-based and hosted on a URL rather than available for download from Apple’s iTunes. 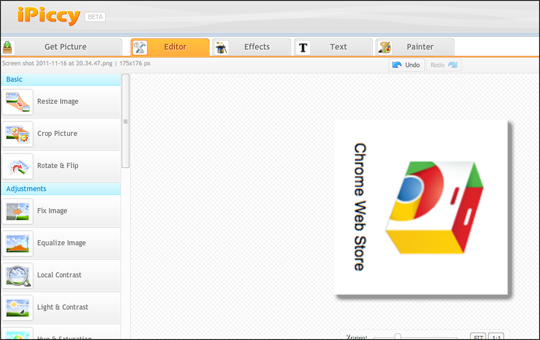 There’s more on web apps v native apps at this link. This entry was posted in Mobile, Social media and blogging and tagged HTML 5, Twitter, web apps on August 3, 2011 by Sarah Marshall. The Financial Times’ new web-based app has been viewed 150,000 times since its launch 10 days ago, which includes 100,000 hits in the first week of launch, the FT said in a media release today. The FT is the first major news publisher to launch this type of HTML5 hybrid app, which can be viewed across a number of different smartphone and tablet devices. 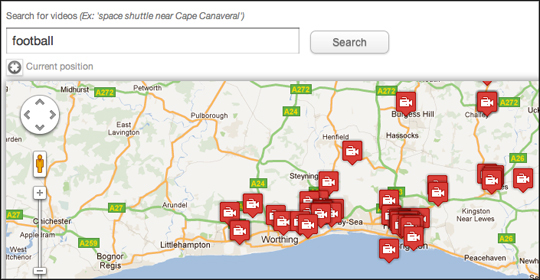 Steve Pinches, FT group product head, said the app has received very positive feedback. He explained where the app is heading. “We will take a two-fold approach to improvements to the app. Firstly we will focus on adding new content to the existing app, including special reports, newspaper graphics and the ability to save articles for later. Secondly we will develop the app for other devices including Honeycomb, Samsung and BlackBerry Playbook. Initial analysis shows the ‘Companies’ section of the web-app is the most popular, followed by the Life and Arts section, which makes up around 10 per cent of consumption overall. 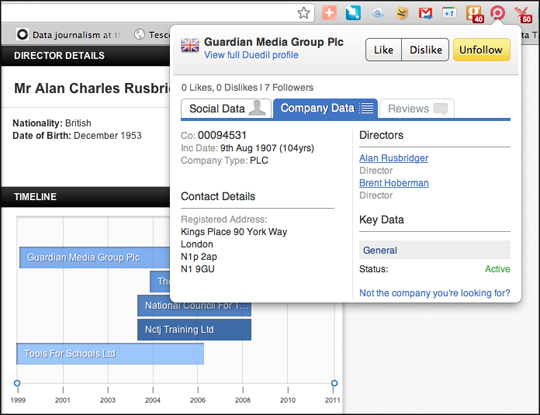 Other popular features include Markets Data, World, Markets and Lex. This entry was posted in Handy tools and technology, Mobile, Traffic and tagged html5, Smartphone, steve pinches, The Financial Times, web apps on June 17, 2011 by Sarah Marshall. 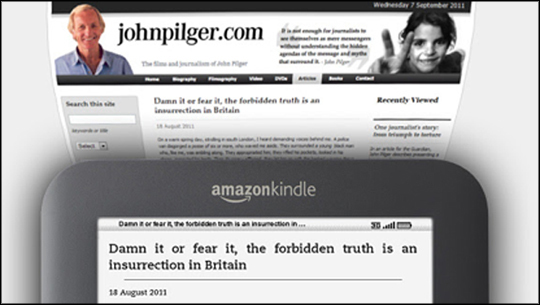 It’s almost a daily occurrence to hear about the perilous state of the news industry (remember AngryJournalist.com anyone?) so Praise Be and Hallelujah for Joe Murphy and his HappyJournalist blog. Each week we give developers the opportunity to tell us why we should sit up and pay attention to the sites and devices they are working on – this week Joe tells us about the site he developed to celebrate what’s good about working as a journalist. I’m Joe Murphy. I’m a reporter-turned-web designer-turned-web developer. My day job is as the senior developer for The Denver Post’s website. I build and maintain web apps, fix stuff, and do other tech-type-stuff. In my hobby-time I build and maintain a handful of sites, apps and blogs … HappyJournalist is one of them. Well, it’s not a particularly useful site. Fun, yes. Useful, no. HappyJournalist is a lens on journalists who have something to say, like what they do, and feel comfortable typing and clicking the submit button on the blog. Until we get to the point where the internet has tools to quantify and publish emotion-related information, HappyJournalist will be a semi-static repository of what was said by the folk who have something to say. That ‘until’ is a big, big ‘until’. I’ve been exploring that ‘What’s Next’ idea and have listed some other ideas (MildlyEnthusiasticJournalist.com and DrunkJournalist.com are my favourites, and a few people have contributed their own). To make this interesting and forward thinking I’m considering pitching a new micro-format that describes emotions. There’s no good way to aggregate or publish emotion-based information online yet. Seems like that’s a big gap in the web, don’t you think? The internet’s gears turn because the robots and computers turn the gears, but it’s the humans that make the internet come alive and sparkle. Fun, conversation, curiosity. AngryJournalist started the dialogue, and it would be a shame to let this “I am a journalist and I have feelings” thread die after the first salvo. It’s free, it will always be free. I won’t — it cost me 90 minutes and eight bucks to create this, so I don’t have a huge stake in getting that time or money back. This entry was posted in Journalism and tagged blogs, Funny, Innovations in Journalism, Joe Murphy, journalist, reporter-turned-web designer-turned-web developer, senior developer, The Denver Post, USA, web apps on April 8, 2008 by Oliver Luft.